The lovely Lorel Clayton and Kelly (whose last name I don’t know – sorry Kelly!) have both given me blog awards! I’m so humbled and honored. Lorel gave me the Sugar Doll Award, and Kelly gave me the Honest Scrap Award. Hooray! Both these beautiful ladies have great blogs, and if you haven’t checked them out yet, please stop by! The rules for accepting both awards are to list ten things about myself, but I’m not going to list twenty things because y’all would hate me by the end of it. So, here are my ten things. 1) I have a very fluffy, beautiful, sassy, entitled cat who I suspect might be some incarnation of Paris Hilton. 2) My husband and I drive the exact same car, but in different colors. Yes, we are “that couple” on our street. 3) My day job involves a foreign language and lots of teenagers. Disaster? Sometimes. Exciting? Always. 4) I rarely look as excited as I feel about life. The last time I screamed and jumped up and down was when I got offered representation by my agent. But I’m a happy person, really. Just not always visibly so. 5) I am even-tempered 99% of the time, but when my temper flares, you better get out of the way. 6) The last time I lost my temper was in May 2003 at a hotel near Gatwick Airport in London. See? It’s a really rare event. 7) I am a knitting fiend… but I can only knit scarves. Hats are out of the question. 8) I really like the taste of desserts, but sugar makes me feel really sick. If I drink more than about five sips of a Coke, I break out in a cold sweat and get really jittery. The same thing happens with cookies, brownies, or anything else sweet. As a result, I tend to avoid sugar, which is a tragedy of epic proportions. 9) I will, however, consume all the carbs and/or saturated fats you put in front of me. 10) I was born, raised, and currently live in Birmingham, Alabama, but I don’t have much of a southern accent. In fact, most of the time, I sound like a midwesterner. This is always really disappointing to people from the North or West who think southern accents are cute. The only time you’ll hear a little bit of a twang is when I’m really mad (which is when I start to sound like Joy on My Name is Earl). And there you have it! Now I get to pass the awards on. Here we go. Fabulous writers. Amazing blogs. Go. Go to their blogs now. You can't eat sugar – that is most definitely a tragedy of epic proportions!! Ha! I thought you lived in the south by some of your tweets. I'm in Columbus, GA. That's not to far away :o) And it means I know another "local" writer. So sad about the sugar. And I'm completely with you on #5. #3 My day job involves children and a foreign language. The language is Gibberish. Probably not as exciting as your day job. Oh my word, you are so adorable. Joy in My Name is Earl….hahahahaha! I want to see that–the fired up southern tempest that is Anne. I feel so terrible that you don't enjoy sugar. It happens to be my very favorite thing to consume, aside from carbs. One of my favorite treats is a slice of bread loaded with dulce de leche. I know, it's a sickness. Congrats on your awards, and thank you so very much for the Sugar Doll award!!!! I LOVE it because as you now know, I LOVE sugar. I will have fun blogging about this one. By the way, I adore the notion of you two as "that couple." So, so cute. In our house, I always drive the nice car and my husband always drives the beater. Although it does even out a little as I bought him a nicer laptop than he bought me. Except, we've traded and I now use his laptop. Still…. Aw, my first award for my book blog! =) Thanks Anne! And I love that you and your husband are "that couple" but hey! when you find a car you love, you stick with it! Two awards in one day, you're just that awesome! 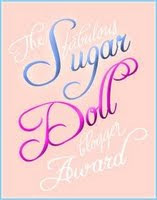 The Sugar Doll award is one of my newest favorites now because I got to learn more about you! Thanks everyone! And please do go check out those blogs. They are well worth it! Congrats! I've been seeing this Sugar Doll thing go around, half-expecting someone to give it to me as a joke. Every time I read a post about it I'm expecting to see my name listed a the bottom, and scroll down with a sense of incipient dread. Fortunately, my blog friends have been most circumspect thus far. And NO THIS IS NOT AN INVITATION FOR ANYONE TO DO IT ALTHOUGH I REALIZE I MAY HAVE JUST SHOT MYSELF IN THE FRIGGIN' FOOT BY SAYING THIS! Dear readers: I will give $5 to the first person who gives Simon the Sugar Doll Award. HA! Simon secretly wants the award. That's why he mentioned it! Kelly is your COUSIN? How fun! And she lives in Bama! She doesn't live in Birmingham, does she? Simon: Don't pretend you didn't see this coming. But, carbs are pretty good too (potato chips = yum). Anne, thank you SO much for the award AND for sharing those things about you. I enjoyed reading them immensely. I wish I couldn't eat sugar! I have to do everything just to stay away from the stuff! Long live our cats, knitting…and blogging! Ha! Y'all are so fun. I am so blessed to have such fantastic readers. Thanks, everybody! She lives in Mobile and JUST (as in December 09) graduated from University of Alabama 🙂 Small world, huh?